NASHVILLE, Tenn. – A quick glance at the Titans roster exhibits more than a few direct links to the Patriots. Titans running back Dion Lewis played the last three seasons with the Patriots. Cornerback Logan Ryan had a four-year run with the Patriots before signing with the Titans prior to the 2017 season. The Titans other starting cornerback, Malcolm Butler, played the past four seasons with the Patriots before signing with the Titans. Even Titans coach Mike Vrabel has New England ties, having played linebacker for eight seasons (2001-2008), and hired defensive coordinator Dean Pees, a former Patriots linebackers coach and defensive coordinator. And Titans general manager Mike Robinson spent 12 years with the Patriots, serving as the franchise’s director of college scouting. So, it’s not surprising there was some incentive for the Titans when they played the Patriots at Nissan Stadium Sunday. Titans quarterback Marcus Mariota threw for 228 yards and a pair of touchdowns and the Titans moved back above .500 with a resounding 34-10 win. “It’s a real sweet win, you know especially when you used to be there, and they didn’t want to bring your back,” said Lewis, who ran for 57 yards on 20 carries and added a pair of catches. Mariota, who also ran for 21 yards and had one catch for 21 yards, repeatedly found receiver Corey Davis who had seven catches for 125 yards and a touchdown. Tight end Jonnu Smith had three catches for 45 yards and a touchdown. The Titans built a 17-3 first-quarter lead and held the Patriots scoreless after halftime with quarterback Tom Brady, playing in his 300th game, being pulled late after the Titans built a 24-point lead. Brady threw for 254 yards, but he completed only 21 of his 42 attempts and didn’t have a touchdown pass. Brady finished with a QB rating of 70.6, while Mariota had a QB rating of 125. “The Titans did a better job than we did in every part of the game, every phase of the game,” Patriots coach Bill Belichick said. Brady was sacked three times and was under constant pressure, being hit six times. The Patriots were held to 40 rushing yards on 19 carries and were 3-of-15 on third-down conversion attempts. The Patriots (7-3) had won six straight since a 26-10 loss to the Lions on Sept. 23. The 24-point loss was the largest loss margin this season. It was the Titans’ first win against the Patriots since Dec. 16, 2002, ending a seven-game losing streak. The Titans, who had a short week following their win over the Cowboys on Monday, moved to 5-4. 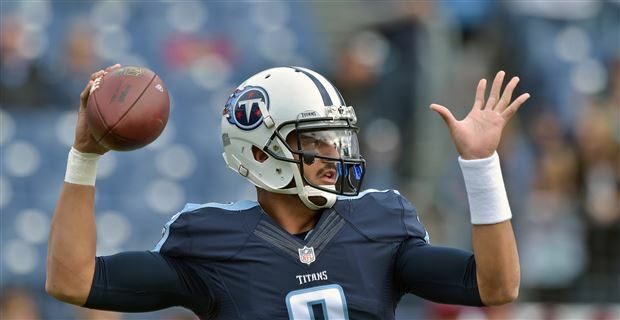 Mariota threw touchdown passes of 4 and 23-yards to Smith and Davis, respectively, as the Titans built a 14-3 lead. Ryan Succop’s 33-yard field goal pushed the Titans ahead 17-3 after the first quarter. The Titans took a 24-10 lead into halftime on Derrick Henry’s 1-yard touchdown run with 1:09 left in the second quarter. Henry added a 10-yard TD run in the fourth quarter and was the Titans’ leading rusher, finishing with 58 yards on 11 carries.